Eastern Washington became the third Big Sky team to take on Idaho this year, and if we use them as a barometer, the Eagles are better than Montana and Montana State. They jumped out to an early 27-7 lead en route to a 73-66 victory, pushing their record to 4-2. Cliff Ederaine continued his impressive senior season, notching 13 points and 8 rebounds, having another efficient night from the floor. Cliff Colimon also had 13 points, and dished out a team-high 6 assists to go with it. Junior big man Jordan Hickert had his best game of the year off the bench, as he hit 4 three balls to finish with 12 points. There were two keys to this game. The first was the defense, as the Eagles held them to 4 points for the first 9 1/2 minutes of the game, helping them build their lead. 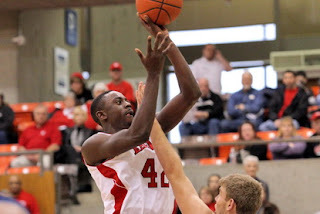 Jeffrey Forbes was key defensively, as he held Idaho's leading scorer Deremy Geiger to just 8 points. The other key was three-point shooting, as Eastern Washington made 13/28 in the game. Their offense is heavily predicated on hitting the outside shot, so when they do that, they can beat anyone. It is early in the year, but the Eagles are looking extremely impressive, and certainly have jumped into the top 3 in everyone's mind. They travel to Washington State on December 3rd, and that is a winnable game. If they do pull it out, the Mid-Major top 25 might soon be making room for Eastern Washington. I think @WSU is more than winnable... they're on the same level as Idaho, maybe slightly better. I mean hell, the Cougs just lost to UC-Riverside a couple days ago. Their best win is against a mediocre to poor Sac State. Overall great writeup though... awesome blog!